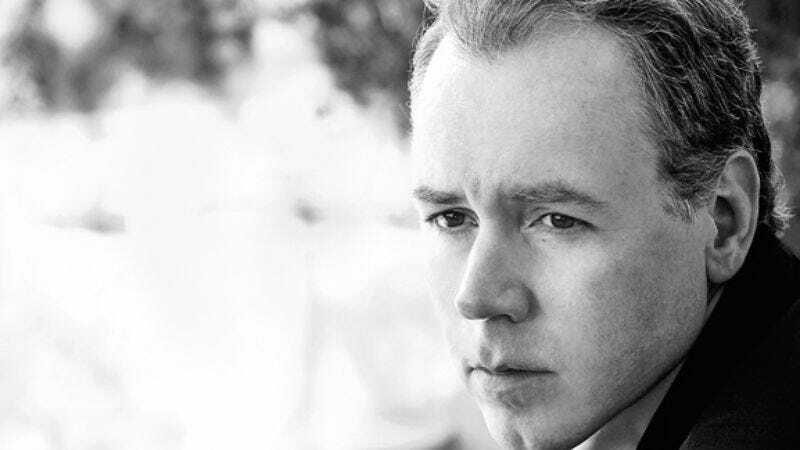 At age 21, while still a student at Bennington College in Vermont (a school thinly disguised as Camden College in his books), Bret Easton Ellis made a considerable splash with his 1985 debut novel Less Than Zero, about the drug-addled nightlife of wealthy young Los Angelenos. Four novels and a short-story collection later, Ellis remains one of the most polarizing figures in the literary world, a moralist and satirist whose vision of upper-crust excess and spiritual vacancy has been criticized by some as indulgence in same. Still others have rallied around him and earned him a considerable cult following, particularly in the wake of American Psycho, a book that so controversial that it was dropped by its original publisher, and The New York Times dispatched two different critics to pan it mercilessly. Ellis’ other novels—The Rules Of Attraction, Glamorama, and Lunar Park—have proved similarly divisive, as have the ambitious film versions of American Psycho and The Rules Of Attraction. (Everyone, including Ellis, seems to agree that Less Than Zero made for a very bad movie.) Ellis is currently readying Imperial Bedrooms, a sequel to Less Than Zero, for publication in 2010. Adapted from his short-story anthology of the same name, The Informers peeks into the interconnected lives of characters in early-’80s Los Angeles, with an ensemble cast including Billy Bob Thornton, Kim Basinger, Mickey Rourke, Jon Foster, Winona Ryder, Brad Renfro (in his final turn), Chris Isaak, and Amber Heard. For the first time, Ellis had a direct hand in the production, adapting the script with co-writer Nicholas Jarecki. Ellis recently spoke to The A.V. Club about adaptations of his work, his blunt feelings toward people who don’t like his characters, and the American Psycho stage musical. The A.V. Club: You wrote a draft of American Psycho for David Cronenberg, but The Informers is the first time you’ve scripted an adaptation of one of your books and had it made into a movie. How did that happen? Were you shut out of the process in previous adaptations? BEE: Because it was a two-hour-40-minute movie, this kind of sprawling, 30-character story based in L.A. in 1983. Both of our agents politely read the script and said, “Okay, this is never going to get made. Move on to something else.” But Nick was very persistent, and he found someone who loved the script and got the money to make the movie, because it was fairly expensive to make. So that’s how it happened. Marco Weber produced the film, got the money to make the film, and got a great cast. AVC: Didn’t Jarecki want to direct? BEE: Yes, he always intended to direct it. BEE: What happened was, the people with the money became very worried that this movie could not be directed by a first-time guy. And also in terms of getting the cast that they wanted, I guess a lot of actors were skittish about working with a first-time director on a movie like this. So he was replaced by Gregor Jordan. But it was always his intention to direct the film. AVC: How did you go about solving the problem of adapting this material? BEE: You know what? It really wasn’t that much of a problem. It seemed more daunting at first than it ended up being. We found one guy that appeared in a lot of the stories and we decided to build a movie around him, the Jon Foster character. We’d already decided which six or seven stories to focus on, and once we sat down with the book, it wasn’t really that hard. Everything kind of fell into place, and every story started to tell itself. It was actually a really fun experience writing the script. AVC: You’ve said that Jarecki came to you with an idea on how to crack it. BEE: Definitely. I’d always wanted to make The Informers into a movie, and Nick really was the catalyst for making it happen. When we initially sat down to talk, he said, “What six or seven stories are you interested in turning into a movie?” I told him mine and he told me his, and we overlapped on like two or three. He was more interested in stories I didn’t want to go to. I really just wanted to concentrate on the family stories and stories about the son, the daughter, the mom, the dad, etc. He was more interested in the criminal, the vampire, the rock star. Once we figured out how they could all be intertwined, it became fun. It was a very loose adaptation. There’s a lot of stuff taken from the book that one character says that’s given to another in the movie. There’s a lot of freedom to it, because it wasn’t a novel, and we didn’t really have to stick to any particular story. We could run around through these 13 stories and do with them what we want. There wasn’t any kind of fixed narrative there, so we had to create one ourselves. It was a very enjoyable experience writing the script. AVC: You’ve had some experiences with writing screenplays in the past, including a monster movie you tried to do for DreamWorks. What did you take away from those experiences? I’m getting off the topic. You asked me what did I learn about my screenwriting? Nothing. [Laughs.] I didn’t really learn anything at all. I learned that if you want to do it, you should do it and be polite. AVC: How much does the finished film resemble the script? AVC: So you had still handed them the much longer script. AVC: But you wrote something more like Short Cuts. BEE: More Short Cuts-like, only much more somber. By the way, every scene in the movie was in some way or another in the script, and there’s a lot of dialogue from the script, which is from the book. But yeah, we were thinking of something funnier. Nick and I wanted to do… His main influences were Pulp Fiction, Magnolia, Boogie Nights. And we agreed: Short Cuts, Nashville, we were thinking of movies along that line. AVC: It seems like previous adaptations of your books that have worked, like American Psycho or The Rules Of Attraction, have benefited greatly from comedy. AVC: The tone of The Informers is really funereal. This isn’t a terribly funny movie. BEE: No, and the script was really funny. [Laughs.] So what do you do? This is why the screenwriter should never be interviewed when a movie’s premièring. This really should be the director’s job, because it’s a director’s medium. It’s not a screenwriter’s medium. And actually going through this, being on the set and meeting the actors, you’re even more aware that it’s an actor’s medium, much more than it is a screenwriter’s medium, because they change so much of what you’re doing in terms of how they interpret it. Personally, I always think a lot of my work is funny—at least, I think it’s funny, I’m amused by it. Certainly I think in Rules Of Attraction that comes through, and in American Psycho. I think a lot of the work is funny, and in the script for The Informers,there was a lot of comedy in it. I wrote the script, it was made, and now it’s not funny. What do you do? What do I do? Do I sit around and complain about it? Not really. This is how [Gregor] read the script and interpreted it, and this is how he decided to shoot it, and this is also how he decided to cut the movie. And again, I’m on the same page with Gregor and Marco in terms of… Well, in terms of being friendly and social with each other. I said, “Look, you know I have issues about this cut of the movie. There were cuts of the movie I thought were much better.” And they said, “This is the cut we like. This is what we want to go out with. There are DVDs. Maybe you can do a cut, Bret.” [Laughs.] Which I’m not particularly interested in doing. AVC: What do you make of the timing of this movie? The problems of wealthy people in the ’80s may not be as resonant now that so many people are struggling financially. Or is that the wrong way of looking at it? BEE: [Laughs.] It’s a very suggestive way of looking at it. It’s a theory, but it has nothing to do with why we made the movie. But the movie coming out in this particularly troublesome time, I don’t know. Quite honestly, I haven’t even really thought about that. This is just a movie that people wanted to make. I don’t really think we were thinking about now so much as the past and the end of the ’70s, the beginning of the ’80s. We were just trying to make a good movie. The people who the movie is about, in terms of today… Will they want to see the movie? I don’t know. Maybe. I have no idea. I really don’t. I’m not even thinking about that. AVC: How protective are you over the way your books are adapted? AVC: Does it bother you to see what happens to them, or do you just let them go? BEE: If I really, really cared so much, I would not let them be made. Writers can do that. They can say, “I’m not signing the papers. I’m not selling the rights to my book.” I think of it as a completely different medium, and it doesn’t really worry me or bother me when people adapt a work. I think the books are the books. They were conceived as books. They weren’t conceived as movies. When I write scripts, that’s an idea and a situation that I think is a really good idea for a movie. When I’m writing a book, I’m not thinking, “Oh, this would be a great movie.” This would be a very interesting book. And I think the books are things that cannot really be adapted into another medium. AVC: And yet your books keep getting made into movies. BEE: What do you think about that? What’s going on there? I mean, why? I just got an e-mail this morning about Lunar Park and its progression; they seem very serious on doing it. What is your theory on that? Why do you think these books keep getting made into movies? I don’t know. AVC: What was your working relationship with director Roger Avary on that movie? BEE: Actually, there was no working relationship. I had written a script originally for Breck Eisner, who was the first director attached to that. I got to know Breck really well, and I thought that was going to happen. And then, of course, in the usual fashion, it fell apart and the producers were looking for another director, and they found Roger. I only met with Roger a couple of times. Then he went and made the movie, and I remember seeing a longer rough cut of it about eight months before it was released. Kind of preparing myself for the worst, I skimmed his script—and I had a lot of other things going on in my life at that point—but I remember very clearly going to the screening of it in Culver City and just realizing “Yes, someone has finally captured my sensibility in a way that hadn’t been done before in the previous two adaptations.” There’s a lot missing from the book, sure. But I was kind of excited by it. It’s something that, whenever it pops up, I can watch over and over. Roger and I did become very friendly after that. I sold the rights to Glamorama to him, because he wanted to make that into a movie. That was a very happy experience, I thought. I don’t know why Roger was the one—maybe it was an easier book. Maybe because it was something he could play around with more. AVC: Based on Killing Zoe and Pulp Fiction, he seems like a guy who wasn’t going to shy away from the material in the book, or apologize for it. You’ve said the film version of American Psycho was sort of done in quotation marks. There’s a kind of a reticence to really tackle the material as it is. BEE: I think Roger was pretty fearless about it. But he’s also dealing with kind of a college movie, where it doesn’t seem on the surface that a lot’s at stake, and then by the end of it, you realize that there was quite a bit at stake. He took this material from a book of mine that I think is flawed in a lot of ways, but I thought he elevated it to another realm. And maybe it was because he didn’t feel he needed to be so careful with the material, which I’m sure [American Psycho co-writer/director] Mary Harron definitely felt she had to be. I don’t know about Gregor. I think that he felt he was doing a very honest job. And on a surface level, I think The Informers is very beautiful, and I think he did do a really good job visually. It has this very cold, gleaming, surface-y quality to it that I like. But why did some of them work and some of them not? I have nothing more to say about that. Prod me into something else. I don’t know why Roger’s worked so well. Less Than Zero is obviously bad, and we don’t need to talk about why that didn’t work. And American Psycho—that is, I think, an impossible book to adapt. But whatever, it was the greatest hits from the book, more or less. Mary did a very good job of keeping that movie together, as did Christian Bale, and I think Roger did a terrific job. And with The Informers, I think there is really an outstanding movie floating out there somewhere, and I hope one day people might be able to see it. But it’s very interesting. I am not comparing The Informers to The Godfather on any level, but there’s that famous story where Paramount asked Coppola to cut like an hour out of the movie, because they didn’t want to release a three-hour movie. And Coppola did, and showed it to the executive, and it was terrible. It moved very slowly at two hours. And then when he put the other hour back in, it moved very quickly. And that’s all I want to say about The Informers. Did you see Hunger, by Steve McQueen? Hunger is probably the most impressive movie I’ve seen in ’09, in the first quarter. It’s the one that put me most in awe. But it’s also going to be a battle between aesthetics and morality. If you come at movies with your own sense of morality and not your own sense of aesthetics, I think you’re screwed. I think that’s not a way to look at movies. If you start looking at movies on a moral level—“I don’t like that, that hurts, that’s mean, that’s bad”—then I don’t even want to talk to you. Or like, someone that says “I don’t like science-fiction movies,” or “I don’t want to sit through a Western,” or “I don’t like violence in movies,” then I completely tune out. BEE: If people think that, that’s their problem. The makers are not thinking that. That’s not a reason why you go to a movie. I mean, hang out with your friends instead. Don’t go to a movie to get that—that’s pure narcissism. That’s saying, “I want to get my ego reflected in the film that I’m watching.” Then what are you going go see? The best filmmakers know to put that aside and just wrestle with their own obsessions, more or less. But yeah, I’m sure one complaint about The Informers is “Why should I care?” The rallying cry of the narcissist! I think you should care for a number of reasons, if you are inclined to do so. Look, on a certain level, I think it’s fantastic that a movie like The Informers gets made on such a huge budget. And it is an attempt at a throwback to a kind of movie that is barely ever made anymore. And that it’s being released in 500 theaters on April 24 is a testament to the sheer will of the makers of the movie. AVC: When we last interviewed you back in 1999 [http://www.avclub.com/articles/bret-easton-ellis,13586/], you said, “I’ve never written a single scene that I can say took place, I’ve never written a line of dialogue that I’ve heard someone say or that I have said.” So with that in mind, what is the source of your observations? BEE: My own tortured soul! [Laughs.] My own tortured psyche. AVC: The question sort of arose over the perception that your books are autobiographical in some way. BEE: Well, they are autobiographical in the sense that they reflect who I was at a particular moment in my life. There was talk of a memoir, and I realized why I couldn’t write a memoir, because the books are the memoir—they completely sum up how I was feeling, what I was thinking about, what my obsessions were, what I was fantasizing about, who I was, in a fictional context over the last 25 years or so. I don’t really look at writing as like, “Oh yeah, I went out with Donna and Frank the other night, and she said something really interesting, and God, the way he lit his cigarette was kind of a cool thing. I’m gonna jot that down and put that in the book I’m working on.” It just doesn’t work that way. I don’t know how it works. I don’t know why I write what I write. I mean, it’s impossible to talk about. I don’t know. AVC: If you could go back in time and give advice to the kid who wrote Less Than Zero, what would it be? BEE: [Long pause.] Not to take everything so seriously. To understand that… you know what, I’m not gonna answer this question. When’s the last time someone asked you that, and you realized not only do you have to answer it, but it’s gonna be put in the newspaper? AVC: So how about the American Psycho musical? Are you excited? BEE: It’s not what you think at all. It’s a rock musical, with like a band. It’s like a multimedia rave situation. It’s not like a straight-ahead Broadway musical with guys in Armani suits doing jazz hands with an old-style score. It’s like a concert, in a way. You get this idea in your head that it’s 42nd Street or something, and it’s not. It’s a very different kind of musical. We’ll see. It’s still a long way down the road. But I’ve talked to everybody involved, and the reason to move forward with it was exactly because of how the guys who are doing this want to do it. It’s not old-school Broadway. It’s very new, interesting concepts. AVC: Is it like an Evil Dead 2 thing, where people are wearing ponchos in the front row? BEE: It’s hard to describe, and I shouldn’t go so much into it. I’m fine with that. It’s looking good. AVC: A lot of Rules Of Attraction fans would ask you if Glitterati will ever see the light of day. BEE: For many legal reasons, it will never see the light of day. You can’t really show Glitterati in public, it’s not possible. There are a lot of people who would be very upset. I don’t even know if they got permission from a lot of the people in it, which might be a big problem, why it’s only shown privately. AVC: Todd Haynes’ Superstar: The Karen Carpenter Story can also never be shown for rights reasons, but it’s found its way into underground circles. So maybe there’s hope? BEE: Roger’s obsessed with containment of this. I think it would ruin marriages. [Laughs] I think what they shot is… I think it’ll be a long time before they can show this movie. I think Kip Pardue would be okay with it, maybe. But it’s basically about 90 minutes of him in character actually seducing women throughout Europe. Much of this was shot late at night, and people didn’t care. I just don’t know what you could do with it. You can’t really show this movie in public.